Seah’s ‘poster girl’ profile picture is a traditional strategy that all politicians have adopted to help voters recognise them. A smiling candidate on a poster hanging on the street lamp is one of the oldest signs that an election is happening. Since the Republic’s first post-independence election in 1968, such posters have contained the candidate’s photo, name (usually in English and Chinese), and party logo. Sometimes, they also included the party’s slogan and a call-to-action: either a “Vote (insert party name)” or a graphic of a hand drawing an “X” on a ballot paper box — how one would indicate their choice when voting. While the elements have remained from one election to another, how they are put together in a poster design has been ever-changing, often reflecting the respective political parties’ evolution and the resources available to its designers. The People’s Action Party (PAP), which has won every post- independence election, has been the dominant political party, and this is clearly visible in its election posters. Throughout the years, they have looked clear and disciplined, the image of a professional and credible party. Up till the ‘90s, PAP’s posters came in a variety of templates in the party’s blue and red that framed its candidates’ standardised black and white photos. Besides posters for its candidate, the party also printed ones with its logo or its manifesto’s slogans—in colour and in each of the four national languages. To be able to produce a variety of colour posters at a time when colour printing was still not widely available showed the vast resources the party had. Under Lee Kuan Yew’s reign as founding secretary-general, the PAP’s posters between the ‘70s and ‘90s adopted a modernist style. The elements were ordered into a template designed with angular lines and solid sans serif typefaces. When Goh Chok Tong took over the PAP in 1992, the posters took on a distinctly different visual identity. With the availability of affordable colour printing, it came in full colour. As if that wasn’t enough, there was not only elements in the traditional party colours of red, blue and white, but also pastel green, purple and yellow. More significant was the introduction of a softer design. In the 1997 posters, the rigid red and blue lines were replaced by curvy ones. Come the 2000s, when digital imaging came into the picture, the candidates’ photos were cropped out of their rectangular frames and placed on circular backgrounds instead. This seemed to reflect Goh’s style of politics, whom his successor Lee Hsien Loong described as “milder, gentler, consultative and inclusive, but firm and clear”. Under its new leader Lee from 2004, the party’s posters reined in the colourful riot and returned to its primary colours. Like his father, the PAP’s founding secretary-general, the younger Lee made use of photos to power his election campaigns, bringing back a touch of realism as compared to Goh’s preference for colourful phrases and designs such as 1991’s “Go For More Good Years”, and the rainbow coloured “Singapore 21” in the next election. In Lee’s first election as secretary- general in 2006, he used digital imaging to create a rendering of the future Marina Bay area, blending it with a crowd “backing” him—an image that literally translated its accompanying slogan “Staying Together, Moving Ahead”. For this year’s campaign, its manifesto poster again had a crowd behind a waving Lee, as he asked voters to support his party’s vision of “Securing Our Future Together”. These posters are reminiscent of those in the ‘80s under the elder Lee when photos were also used to visualise the party’s slogans. In the 1980 and 1984 elections, photos of Singapore’s past and present were put side by side to show the progress the country had made under PAP’s rule. Similarly, in its 1988 manifesto poster, the then newly built Mass Rapid Transit system was set against the backdrop of Singapore’s financial district as an accompanying photo for its slogan: “Singapore’s On The Right Track Let’s Stay On It”. In contrast to PAP’s sophistication and carefully designed posters, those from the independent candidates and opposition parties have generally looked amateurish, ranging from bare to cluttered. Prior to the ‘90s, their posters were printed in just one or two colours. Besides one for the party’s logo, the opposition could only afford one other type of poster that packed the candidates’ details as well as the party information in all four languages. What resulted was often a cluttered poster unlike the PAP’s single-message ones. There was also little use of design to create distinct posters, often the only difference being the parties’ logo! On the other end of the spectrum were posters that had nothing more than a candidate picture and a call-to-action. Over the years, these have collectively given “the negative image that most opposition parties presently suffer from”. However, there has been a significant shift towards cultivating a professional and credible image in the last two decades. Since colour printing became affordable from the 2000s, the opposition parties have became more design-conscious, using elements like colour to create a distinct look to help their posters and party stand out. The Workers’ Party (WP) is one that has undergone a major image makeover and reaped benefits. This election, it became the first opposition party to ever win a GRC in Aljunied, and is now its leader with eight seats in Parliament. It’s brand’s strength can be seen in a three-cornered fight it faced in Punggol East single-member constituency (SMC) during this election. Even though the party “parachuted” a candidate in, WP easily came in way ahead of the other opposition candidate, although it was not enough to beat the PAP. Desmond Lim, the Singapore Democratic Alliance’s candidate who contested as the other opposition party in Punggol East had worked on the ground for years, but failed to beat the new WP candidate Lee Li Lian. He blamed his loss squarely on WP’s image. “I don’t think I lost because of my individual ability but because residents chose someone who has a (known) brand behind him and would like to associate with it,” he said. The beginnings of WP’s brand transformation can be first seen in its 1988 election posters. It broke away from what had become a standard look of the opposition’s posters: party name in four languages on top; party logo, slogan and candidate picture in the middle; and a call-to-action—all printed in one or two colours. Instead, WP’s posters re-organised the elements into two panels and had generous amounts of white space. This attempt to forge a distinct visual identity continued in various forms for the following two elections in the ‘90s. The changes matched a period of the party’s ascent, having first broken the PAP’s monopoly in Parliament when its secretary-general J. B. Jeyaretnam won a seat in a 1981 by-election and again in 1984. While Jeyaretnam was disqualified from participating in the following two elections, the party kept its presence in Parliament when it’s assistant secretary-general Low Thia Khiang won a seat in Hougang in 1991. When Jeyaretnam returned to contest six years later, WP unveiled its most aggressive manifesto poster to date. Over an image of a crowd, the poster contained WP’s logo and its slogan “Power to the People”, a call it first made in ’91. The poster’s Chinese version had its slogan written in calligraphy, and in a vigour that matched its candidate Tang Liang Hong’s attempt to rouse the Chinese-educated out of their subservient role in Singapore. However, these forceful expressions led to defamation suits that embroiled the party and eventually saw Jeyaretnam leave WP in 2001, paving the way for Low to become its new chief. In Low’s first election as secretary- general that year, WP dropped its fiery imagery, adopting bare and safe posters, even though it still called for “Power to the People”. By the 2006 election, WP unveiled its new image. Its candidate photos were etched out and placed in a orderly template dominated by a sky blue background. Next to the PAP’s posters that also had a blue background that year, one would have found it hard to distinguish the two parties. Low clearly realised the importance of WP having the image of a respectable political party in the voter’s eyes, and what better way than to learn from the one most regarded as so, the PAP? While the ruling party’s members all wore white uniforms, now immortalised in the history book Men in White, Low got WP’s members to wear its now signature sky-blue polo tees. It is a homage to the party’s blue-collared working class roots, and also the image of “calm, cool and collected” party—a break from Jeyaretnam’s fiery rhetoric. Explaining in a Sunday Times interview why he stopped WP’s members from wearing their preferred slippers and T-shirts when he took over, Low said: “I think if we want to move together as a party and you want people to look at you, to respect you, you have to respect yourself with more discipline.” The need to project the right image is also something the rest of the opposition did in the recent election, as the parties decked out their members in smart-looking uniforms in their distinct party colours, many for the very first time. What is also interesting about WP’s image remake is its attempt to break away from relying on a single personality like Low, or Jeyaretnam in the past, to attract votes but to instead build up a reliable party brand. This is one lesson that can be learnt from the fate of the parties founded by another opposition leader Chiam See Tong. In 1991, as then Secretary- General of the Singapore Democratic Party (SDP), Chiam led it to win three seats in Parliament. However, by the next election, Chiam left to form the Singapore People’s Party (SPP), and the SDP lost all its seats. Thus, many political observers have concluded that a major reason SDP won so big that year was because of Chiam’s “unassuming, congenial nature” which enabled him to retain his parliamentary seat since 1984. Fast forward to the recent election, Chiam stepped out of his Potong Pasir stronghold to contest in Bishan- Toa Payoh GRC. However, not only was his team not strong enough to win there, he also lost his base. His wife, whom Chiam appointed as his successor, was unable to hold on to the seat on her own. After Chiam left SDP in 1993, Dr Chee Soon Juan took over the party and it took on a style of confrontational politics. This, however, did not go down well with voters. While the SDP unveiled a new look in the 1997 election, with more modern and distinct posters, it failed to retain its seats in Parliament or win any. Chiam, on the other hand, retained the exact same poster design for his campaign, except with a different party logo, and he still won in Potong Pasir for the fourth consecutive time. Despite the poor results, Chee continued his style of politics into the new millennium, leading SDP through a campaign of civil disobedience that gave it a notorious image amongst the eyes of voters. However, in October last year, the once common sight of a angst-looking Chee wearing self-painted T-shirts like those demanding ‘Democracy Now’ was replaced by a friendly and fuzzy mascot—Danny the Democracy Bear, who wears a red t-shirt printed ‘I SDP’. Instead of leading SDP members on protest walks, Danny gave out sweets to children. This softer image, and Chee’s step away from the spotlight, paid off as the party went from the worst-performing in the 2006 election to fifth best in the recent one, improving its vote share to 36.8 per cent. Recently, Danny was even featured on CNNGo, a travel website, an unusual place to read about a political party. Another party that took on a mascot to distinguish itself is the Singapore Democratic Alliance (SDA). Its secretary-general Desmond Lim came up with Sinpo in August 2010, an ordinary ant that became stronger after he was struck by lightning. According to its official video, Sinpo can shoot energy bolts that shatter high taxes and transport costs in a quest for “A Singapore For Singaporeans”. Sinpo is also available in T-shirts, dolls and keychains to help the party raise funds—a role that is more important now as Lim could not win enough votes in Punggol East, even with Sinpo fighting alongside him, to keep his $16,000 election deposit. The different experiences SDA and SDP have had with their mascots show how image means little without substance. SDP’s Danny was joined by a lineup of accomplished candidates in Tan Jee Say, former principal private secretary of Prime Minister Goh, and Dr Vincent Wijeysingha, who holds a doctorate in social policy. Together, they helped give the SDP a credible image. While the SDA had a whole assortment of Sinpo merchandise, as well as election posters containing catchy verses and even cartoons, they could not hide the fact that its candidates were not as well-educated nor capable, even though they had a lot of heart. At one rally, an SDA candidate even conceded their inadequacies by proposing that ministers who were not re-elected could be brought back into Government as nominated ministers. While only buttons, pens, pencils and balloons were not subjected to regulation by the Elections Department previously, parties in this election could produce diaries, keychains, tissue packets, apparel, clothing accessories, miniature flags and pennants, as well as soft toys without seeking permission. The only other limit related to advertising was how much each candidate could spend on its campaign: It was raised from $3 to $3.50 per voter this time around. Besides soft toys of Danny and Sinpo, the most sought after merchandise this election include umbrellas in the party colours and emblazoned with their logos, as well as mini party flags. Some parties also came up with unique souvenirs, such as NSP’s tissue packets telling voters to help them “Chope” seats in Parliament. Even before this election, WP began selling blue wristbands, clearly inspired by the yellow ones from Lance Armstrong’s 2004 LIVESTRONG fundraising campaign. The PAP also made use of its vast resources to personalise materials like pamphlets and flyers for each constituency. For instance, while those living in Joo Chiat got a pin asking them to ‘Vote for Charles Chong’, those in Aljunied got a rubber ball emblazoned with the party logo instead. This election also marked the first time that campaigning could happen on new media platforms. Overnight, parties and candidates set up Facebook pages, Twitter accounts and videos that they released online. Singaporeans also went online to create their own election advertising, often appropriating popular culture to express support for their candidates of choice or to comment on the election. A popular set of images that went viral was digitally edited movie posters featuring various politicians. 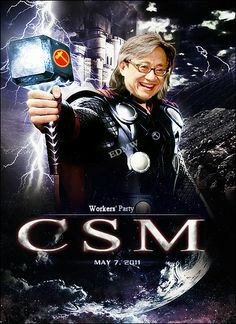 WP’s star candidate Chen Show Mao became comic hero Thor, rightly wielding a WP branded hammer (the party’s symbol), while SPP’s Chiam took over from Captain America to become our very own Captain Singapore! Political cartoons were also revived in the safe haven online. Over this election, websites like Cartoon Press, Spore Says Political Cartoons, The Sketch Times, My sketchbook and Blinking Brink emerged, as their founders drew cartoons that gave a humorous take on the hustings. Such graphic work once practised in newspapers by local cartoonists such as Tan Huay Peng and Morgan Chua, has become almost extinct under a PAP government whose founder Lee Kuan Yew once said: “You cannot mock a great leader in an Asian Confucian society. If he allows himself to be mocked, he is finished.” Interestingly, PAP once used illustrations to mock its opponents as part of its election campaign in 1963. Posters from then show how it depicted the Singapore Alliance as corrupt and the Barisan Sosialis as Communists, while portraying itself as a party that could build Singapore into a modern city as part of Malaysia. Follow City of’s board 2011 · General Elections on Pinterest. The enthusiasm online also spilled over off line. Thousands turned up to rallies and walkabouts, snapping away with their iPhones and cameras. A group of 16 photographers, some award-winning professionals and others passionate hobbyists, even came together to share the pictures they took in a commemorative magazine GE11: We Were There. There were also those who turned up with their self-designed posters and paraphernalia to show their support. A group of six youths, inspired by the artwork produced during the youth-driven Obama campaign, started a guerrilla marketing campaign for PAP’s George Yeo, handing out self-designed “In George We Trust” buttons and “Who Likes George” stickers. At WP rallies, all kinds of hammers were spotted, including one that lit up! At a NSP rally, someone even held up a poster to ask if Nicole Seah would marry him. For the record, Seah said no because she was already married to the party. Collectively, the voters and the candidates made this General Election a visually exciting one. Clearly, parties have become more aware of how to use image and design to promote their politics and their party. Voters have also become more confident in using imaging tools and craft to express their support and thoughts creatively too. How will this trend develop in the next election? This is something all voters are looking forward to within the next five years.